Grey Bruce Facebook Ads reach everyone! Facebook Ads have proven to be a successful option on how to reach people both locally and globally with a moderate budget. With four years of experience marketing to Grey Bruce counties when I worked for Bruce County Tourism, I can attest to the reach and effectiveness of this fact. One of our clients the past year has successfully used Facebook Ads to keep Grey Bruce in mind as a family rainy day activity. What comes to mind to you? Museums, malls, libraries and, of course, your local bowling alley. 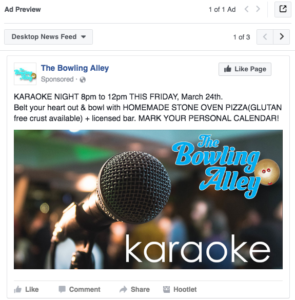 The Owen Sound Bowling Alley has ads that targets Facebook users from a 50 kms area from the city of Owen Sound. This includes Kincardine, up to Tobermory, over to Collingwood and back down to Hanover. That's a large target market customer radius! Facebook Ads not only allow businesses already on Facebook to reach people in specific geographic areas, but it also allows you to reach them based on demographics, time of day and their personal and professional interests. This is very powerful stuff for various industries to reach the right customers looking for their products and services. Having an outlined monthly Editorial Calendar is important for Event Marketing all year long! When you run a business that coexists with seasonal holidays and their own events on a month-to-month basis, it's important to have a plan. The plan we implement for businesses like this is referred to as an “editorial calendar.” Think of it like what a newspaper would use to schedule articles all month or year long. Once you have a plan that's based on dates, times, budget of ad, topic focus of ad and the intended customer target interests and demographics, you can then be creative with the graphics and messaging. You can tie the outlined plan to successful outcomes such as an increase in emails, phone calls, website visits or even downloads of a flyer or services document. How great is that for business marketing insights? Businesses on Facebook like to focus on their page's community growth in followers (and likes), however as a business marketing/goal oriented company, to us - it's more about measuring the success of each ad based on conversions. Did the ad send people to your website? Did the ad increase attendance at your recent event? Did the number of calls and emails increase during the ad date and timeframe run? These are measurable goals and should be outlined prior to doing any advertising. 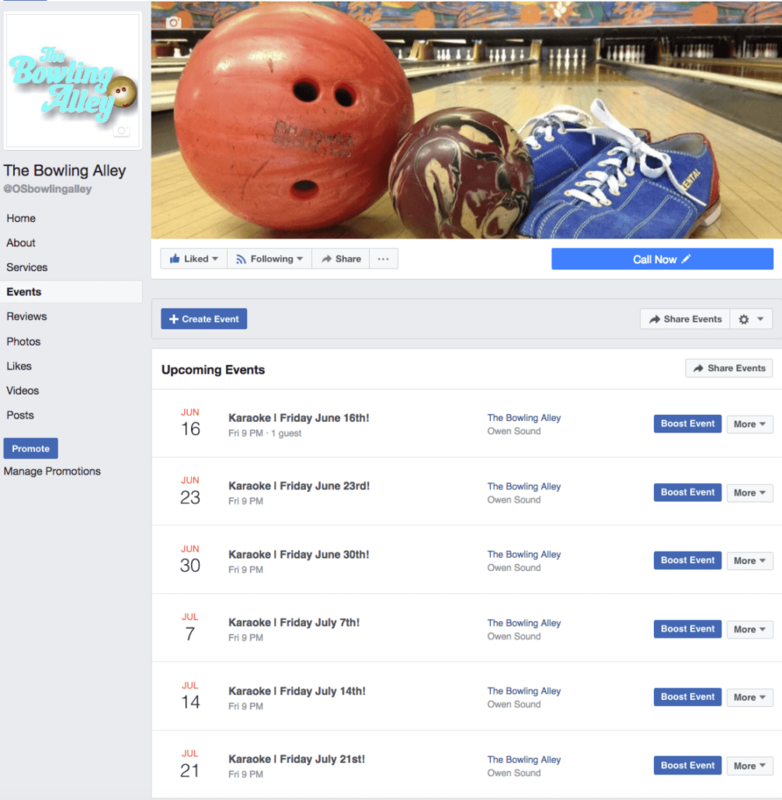 Oh, but just for fun, since we started running the local Owen Sound Bowling Alley page, it's now an active community that recently exceeded 1100 local followers! 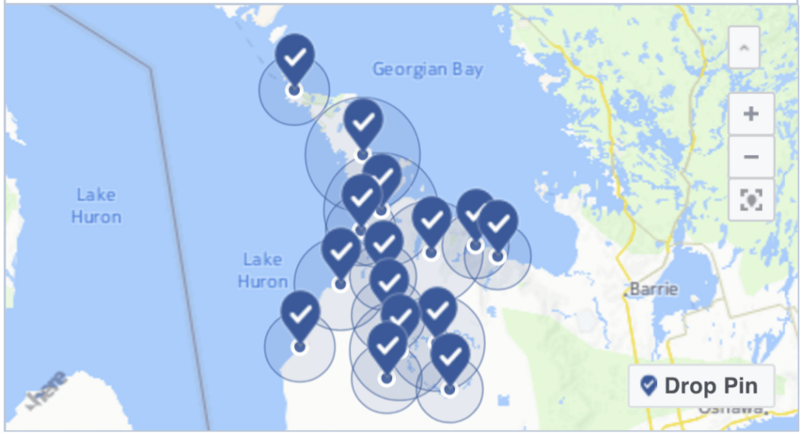 If your business wants to get found more by Grey Bruce target markets on Facebook, give us a call at 519-387-9322. We will setup your ads, target the correct cities. All you have to do is allocate a budget, weekly or monthly, and then let us work on your business! Oh, and we also setup Facebook events for our Facebook business clients! I read this article and found it very interesting, thought it might be something for you. The article is called The Bowling Alley Facebook Ads reach Grey Bruce! and is located at https://www.gemwebb.com/grey-bruce-facebook-marketing-power/.